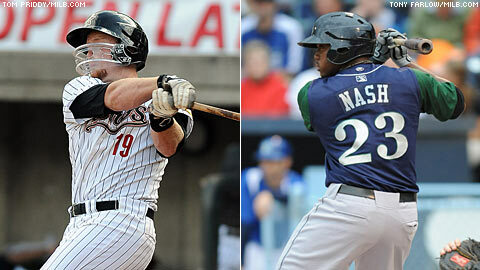 Chris Wallace and Telvin Nash combined for 10 hits -- six of them homers -- and 13 RBIs on Sunday. Two Lexington sluggers put on a legendary performance on Sunday afternoon in an 18-9 rout of host Asheville. The team's No. 3 and 4 hitters, Chris Wallace and Telvin Nash, each went 5-for-6 with three homers, a double and four runs scored. Wallace fell one RBI shy of the South Atlantic League record by driving in nine. Nash finished with four RBIs -- because Wallace had so often cleared the bases ahead of him. "I've had a couple two-homer games in the past, but I don't remember ever having a game like this," Wallace said. "Telvin was joking with me about it in the dugout, saying, 'Save me some RBIs, will you?'" The record of 10 RBIs in a game was set by Asheville's James Barbe on April 22, 1978. The pair of Astros prospects -- both right-handed hitters -- also accumulated 15 total bases apiece, one short of the Sally League mark of 16 held by Gastonia's Pat Garman (1988) and Savannah's Anthony Mongeluzzo (2002), both of whom hit four longballs in their games (also a league record). Wallace, the Legends' catcher, was a 16th-round pick out of the University of Houston last June. He was named an Appalachian League All-Star and Topps Short-Season All-Star after hitting .293 with 10 homers and 40 RBIs in 67 games for Greeneville and Tri-City. Legends outfielder Nash, who served as the club's designated hitter Sunday, was the Astros' third-round pick in the 2009 Draft. As a team, the Legends' 18 runs and 20 hits are league highs this season. The Legends accumulated 42 total bases on Sunday, six shy of the circuit record set by Albany on July 9, 1992. Wallace got things rolling with a one-out, two-run shot in the first inning. Nash followed with a double, but was left stranded. The two reversed the trend in the second, with Wallace doubling and scoring on Nash's first longball of the day. "It's definitely a big help having Telvin hit behind me, as well as having [shortstop] Jiovanni Mier in front," said Wallace. Mier singled three times, walked and scored four runs in the game. After Lexington opened the fourth with consecutive singles by Bryce Lane, Ben Orloff and Mier, Wallace connected for a grand slam. Nash singled in the frame as the Legends notched seven runs on seven hits -- Lane had two of them -- and a walk. All the damage came off Tourists reliever Craig Bennigson. Nash hit a solo shot in the fifth, then the two sluggers went back-to-back in the seventh. Wallace added a single in the eighth. Though the wind was blowing out to center at Asheville's McCormick Field, Wallace didn't think it had too much influence on the duo's dynamic performance. "One of mine might not have made it on a normal day, but I hit the others pretty well. And all of Telvin's [homers] were hit hard," he said. Wallace is batting .444 with five homers and 17 RBIs in 10 games this season, while Nash is hitting .412 with four homers and eight RBIs in four contests. "I haven't really been doing anything different," Wallace said. "I've just been getting in good hitter's counts and making the pitcher come to me." The Asheville offense had a good day as well, collecting 13 hits. Five Tourists had multiple hits and Bryce Massanari and Avery Barnes both went deep. The two teams' combined eight longballs were two short of the Sally League record of 10, set by Columbia and Macon on June 14, 1998. In a rough day for pitchers, Lexington reliever Ruben Alaniz (1-1) notched his first win of the season after allowing three runs on four hits in three innings. He struck out four and did not walk a batter. Asheville starter Joshua Slaats (0-1) took the loss. He gave up six runs on five hits and three walks over two frames.